Siblings Ilse and Wolf hide a deep secret in their blood: with it, they can work magic. And the government just found out.Blackmailed into service during World War II, Ilse lends her magic to America's newest weapon, the atom bomb, while Wolf goes behind enemy lines to sabotage Germany's nuclear program. It's a dangerous mission, but if Hitler were to create the bomb first, the results would be catastrophic.When Wolf's plane is shot down, his entire mission is thrown into jeopardy. Wolf needs Ilse's help to develop the magic that will keep him alive, but with a spy afoot in Ilse's laboratory, the letters she sends to Wolf begin to look treasonous. Can Ilse prove her loyalty—and find a way to help her brother—before their time runs out? Katherine Locke lives in a very small town outside of Philadelphia, Pennsylvania, with her feline overlords. In addition to fiction, she writes about books and reading and has contributed to The Forward, The GayYA, Teen Librarian Toolbox, and other sites. 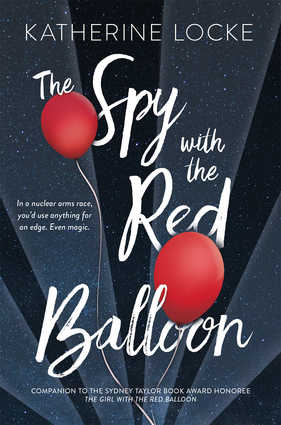 The Girl with the Red Balloon was her YA debut.